A bit of a different angle on the show this week. It's all about mindset and motivation - with guest Luke Staton (Performance Coach and Motivational Speaker). We met Luke at an event we were both speaking at. He managed to get a room full of marketers on their feet, energised and enjoying themselves so we thought he would be prefect for the show! - Hi guys, welcome to Inbound After Hours. Today we have a special guest, we have Luke Staton, and he is a performance coach, and a motivational speaker hence we are all drinking glasses of water today. - I know, being really healthy for once. - We hope. So how's things look, okay? - Yeah great, thank you, thanks for the invite. - Appreciate you having me. - Yeah, no problem, thanks for coming in today. So we've got loads of questions for you. The first one is, tell us a little bit about yourself and the organisations you work with, a bit about your background. -five, 15 quid, thinking this'll be interesting. I must've been about, I think I was eight, nine years of age at the time, so I take the letter home to my parents and I remember giving them the letter just like full of hope that I could go 'cause I'd watched the FA Cup every year with my dad, watched England play, I had posters in my bedroom, that's all I dreamed about. So, I give him the letter, three or four days go by, and I don't hear anything and I can remember now thinking back the anxiety of not being able to go as your mates are bringing in the envelopes and the letters and you come in like, Dad, can I go? And eventually I was allowed to go. So I went into school, I've given the envelope with 15 quid, given the letter, it was about eight weeks from this trip. I can remember it was like a kid building up to Christmas. It was just so exciting, the thought of going to Wembley Stadium. The other kids, it was just more of a trip. To me it meant more than that. So we get on the bus on this particular day and we travel to Wembley Stadium to see the schoolboys play and for me this particular moment certainly transformed my mind forever, and six words were given to me on that day, just six words. And this sounds crazy that like I'm 38 now so 30 years ago, my head teacher said this to me, which I still use these words today with what I work with in my own self. So we get to Wembley Stadium and we're climbing up the steps and we're looking onto the pitch and I just remember, I don't know if you've ever been to Wembley Stadium before, but just looking at the grass and this sounds crazy, but I just the way it was lined perfect shapes. - Just like the most beautiful thing I'd ever seen. And when I think about it now, it's like recreating that moment inside and I get the goosebumps, like I get the excitement, the energy. I remember just being stood at the top of the steps just looking at the pitch and you've got England flags everywhere, you've got people chanting, got all the little schoolkids and I remember all my school mates just whizzing past to just sit down and just not, they were there but they weren't really there. And I'm stood there on the steps and my headmaster come beside me and he just stood there and just looked at me, and the six words that he gave then were just, like, I believe it transformed my life forever and it took me down a path where I am today. He just looked at me and said, in fact I wanna tell you what he said to me a little bit later on. I'll leave that part out, I'll leave it. - I'll give you the six words in a little bit, okay? So that's where it started, that's where my life really begun. From that moment on I just become a different animal. I would start to believe that I wanted to be like them guys so when I could see them guys on that football pitch watching that England game, it was just. - "One day you will play here"? - He could've said that. - We'll all have a guess. - "What are you doing, sit down." - I'm only guessing 'cause I'm hoping to get a background. - Yeah, so as he turned to me, he just said, "That could be you one day." So "that could be you one day," six words. That was it, and until that moment I hadn't really thought about that because I was a kid growing up, I was eight. When he said that to me I remember that moment thinking if somebody that I respect that much can show that belief in me, why not, why not? - So whenever I come across them from the age of eight years of age that would tell me it wasn't possible, you couldn't do it, I just didn't listen because this headmaster I worshipped to, he's an amazing guy. Mr. Spencer, you never forget the people's name and for him to say that to me gave an idea which in a belief that it was possible and then six years later I was there. Six years later I was on the pitch playing for England against Switzerland and then he's in the crowd singing the national anthem with the next school trip. And that just showed me that somebody can give you something the greatest gift we can give is believing in somebody and he gave me that at the age of eight and it took me on to become what I wanted to do with being a professional football player. And even though my career didn't go how I wanted it to and it finished very early, them six words still take me now to do this, to do the next thing, because I look at things and go, why couldn't that be me? That could be, and I hear it as well, as, that could be you one day. So when I see people doing things, I'm like, I could do that. So yeah, that's where my life, that's my earliest memory as a kid growing up. "That could be you one day." And I think from there it's just given a tenacity to keep going, keep going, keep going. And it's led me on now to become a Motivational Speaker Performance Coach because if he could say six words to me to transform my life, you can see I like to say a lot of words so imagine how many words I can give to people. - What you can do in an hour. - In an hour, speaking as fast as you can, it'd be like, it's incredible. So now I'm seeing me being able to do what he did to me across thousands of people really inspires me that what I'm saying people are listening and taking inspiration from. - I met Luke with Paul, we went to an event that one of our clients run called the Be Brilliant Club. And it's for like a group of Marketers to come together and talk about things in the marketing industry so I had a chat about Inbound and Luke came on next to do his performance and motivational side of it. And one of the things I wanted to chat about today is when you get a group of Marketers in the room, how different is that from a group of sportsman or, I know you've been to the NHS or whatever, what's the differences you've seen there? I know me and Paul, as soon as you said stand up and do something, I'm like, oh my god. Like, I don't know if that's the introvert you get in that sort of scenario. But after all you give, different groups change, and what have you noticed about it? - I think every group has similar dynamics, so you've got extroverts, you've got introverts, you've got people who are comfortable to stand up and engage in a fun game, but people that think, this isn't for me. So any group you talk to, you've got the same dynamics whether it's a marketing team, a massive organisation or a sports team. Everybody seems to have that competitive edge, they like competition, or people have got their reservations and, you know, looking at cultures, I do most of my work in the UK so I have a reserved audience quite often. I believe if I were delivering the same kind of seminar in America. - They'd be on their seats. - Yeah, cheering, jumping around. - It is a bit flat. - Yeah, yeah. But in the UK it's like, this guy's off the chain, this guy's crazy, and I believe, I'm like, what's wrong with you lot? So when I worked with the marketers I was thinking, these guys are gonna be kinda American mindset full of energy and, and there was a lot more in that audience it was a lot quicker to get people going than some audiences because I think people who come there go marketing, I've gotta be seen to be able to get out of my comfort zone. But I would still say it was pretty flat. - You know, it was like, where people find it difficult to get out of comfort zones, find it challenging, and we grow up not wanting to say or do anything that's out of line, because when we put our hand up at school and we get a question wrong, what does everyone do? - They laugh at you. - And being proud of what you do. Very often when you say to somebody, what are you great at? Then they don't tell you because you're waiting for 'em to go, "No you're not." Or it's like, if I said to you, what are you great at? People go, "I don't know, I wouldn't say I'm great at it." Yeah and what you're not great at you're proud to say it straight away. So I think that speaking to the marketing companies there was interesting because I expected them to be a lot faster but then it got me thinking, it don't matter who you speak to, we all have the same reservation. - 'Cause when I sit in an audience I feel the same fears of the audience. I just know now how to break them. I think if people understand how to conquer their fears they'd be able to get out of the comfort zone a lot quicker. - Yeah. It's funny what you're saying about people not being able to like, it's not even bragging, is it? It's just telling it how it is, how good things are. We say this about our own marketing a lot is, we never actually say we do a good job for people or it's very rare so we do this a bit more recently but it's still uncomfortable, isn't it? Like we're very comfortable telling people how to do things and delivering great value and educational content but when it comes to saying, "Hey, we're pretty good at marketing." Like. - [Luke] You shut off. - Yeah, we feel like that still. - Yeah, but who wants to work with someone "pretty good?" - You know, I never remember a manager signing a football player because he was "pretty good." - It's 'cause he was outstanding. So really, you know, marketing company, if I say to them tell me what you're about and they go, "we're the best." "We believe we're the best, "We worked to be the best." I wanna hear that 'cause I wanna connect to that. Not "we're pretty good at what we do." I'm like, well, pretty good, I don't want pretty good, I want brilliance, I wanna follow someone who's brilliant. But it's not that they're not brilliant it's the reserved feeling of, should I say that? 'Cause if someone's gonna say actually, you're not, and it's that fear I think of people being proud of what they're achieving. - No, you look at a lot of British marketing, it is like that, isn't it, so reserved? But going back to the American point, you'll go out to a website and it says "We are the best marketing software in the world." Just, that's it, that's what it says on the homepage. - Sometimes we're in the States and we'll be with a group of Americans and I'll do the round the room introductions. I'm Mark from Digital 22. I'm Rikki from Digital 22. "Hi, I'm!" - Yeah! Well, oh geez. It's just a brick mentality as a culture, isn't it? We just need to change that a little bit. - See I thought when we first went to Hubspot over there everybody was, it freaked me out at first 'cause everyone's smiling and everyone's happy and asking how you've been going. - I don't even know you and you're asking how my day was. Oh, this is a bit weird. But then the other good thing is, when you've got people on video everyone was happy to come on video, no one ever said no or looked shocked that we're asking them. Everyone was comfortable talking and that. I was like, when you come in here do you get some sort of PR training? Like I'm sure footballers and stuff have to do that. They're like no, it's just natural. You've got such a different upbringing where it's good to tell people how well you've done and how good your company is and all of this sort of stuff. It's completely different. - Yeah, I agree with you, I mean, let's touch on some organisations you help now or have helped in the past. Similar to our viewers now, marketing professionals, business owners, who have you worked with lately? - So one of the organisations I've worked for around seven years now is PING Europe. -shirt on, I was a fitness trainer at the time. And he says to me, "Quite interesting this health and wellbeing stuff "that you do, we've got 166 people here, "what do you think you could do for us?" So I talked about, well, I'm a health and wellbeing coach and the seminars and fitness classes and all this different stuff. He was like, "Right, okay, sounds great "but we need to ask the people if they're interested." He said, "Can you come in next Tuesday and to a talk?" He said, "I'll shut the factory down, 166 people, "and just do a talk, I'll give you an hour." And I'm like, yeah! But I'm thinking, what am I gonna do for an hour? -shirt, trainers on, and he put me in the canteen, beautiful canteen in Europe, and everybody come to the canteen, he gave me an hour to talk about health and wellbeing. And nobody wants to sit and listen for an hour about eating, sleep, and exercise. So I didn't talk about health and wellbeing once, I told a story about a friend who was hit by a car and left paralysed from the neck down that went on to represent GB and own his own businesses and how when kind of adversity comes that shows a strength of character. So I use storytelling to get them to to engage with me and build a rapport, and then at the end I said, by the way, I'm here to deliver a health and wellbeing programme, if you're interested sign up on the way out. But what they saw from me was somebody that had an energy and a passion to help people. When I told 'em about my friend who was 26 and was hit by a car and paralysed but then didn't give up and went on to achieve great things and still is now, they was inspired by what can be achieved with such little help, such little resource. So I think they was thinking, why don't I make the most of what I've got? So the Managing Director says to me we have 166 people, "I think you'll be a success "if we have 25 people sign up." I was like, 25? - I wanted 166, not 25. - You have to figure out who's not signing up, yeah. -on effect is in work. Travelex, one of the biggest in the world for money exchange. We run leadership programme, performance coaching for them. PKF Cooper Parry, who, you guys remind me of them. Different industry, but very entrepreneurial, very driven, very hungry to provide great culture for the people. To the point you've got a running track now around in your offices so. - That's next on the checklist, isn't it? -learning. How do they get that drive or where do they get it from? I imagine it comes much deeper than just being passionate about marketing. -five mindset. So the best of the best don't finish and start at a time. They're constantly learning and growing and developing. Someone out of Cartonbury Wells now said it's not what you between nine to five that counts, it's what you do between five and midnight. Because if every night you work between five and midnight learning development, just think how much more of an animal you've become, you've become relentless. So for me, it's the person that just switches off, I don't think they're actually into what they do that much. - Or, they've not found the kind of real purpose behind what they do, whether it's they don't buy into the culture of the organisation, they don't buy into where they company's going. They feel distracted from the company, they feel left out, they feel ignored. So their way of not kind of pulling along is to just pull away a little bit and it drops their motivation. Motivation comes from within, and I always believed I could motivate anybody. I really believed that, I used to think, I can't help people if they don't want to be helped. I don't think that's true, I think you can help anybody you've just gotta find the leverage to help that person. So if somebody's plodding and you find some leverage which is, would you want your son to be a plodder? No, no, I want my son to be. Okay, so what kind of role model are you? All of the sudden, the guilt trip, you got to find leverage sometimes. - You've got to find a leverage so I think for anybody to go to the next level they've got to love what they do, to put the hours in, gotta be passionate, they've got to be addicted to it in a way, just kind of obsessive learning and growing to the point where they feel guilty when they're not putting the effort in. And that's not to say you work 24 hours a day but if you're mind's always thinking and thinking you get more excited about what you do and you see the results and the results are great. 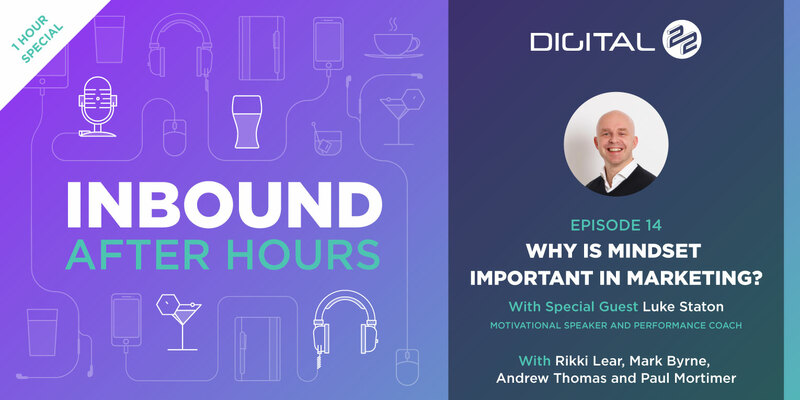 - I mean, without going too deep on the podcast today 'cause it's not likely the style but why do you guys keep learning about Inbound and what drives you to keep at it? - I was just thinking, I've been comparing to old jobs that I've had. So I used to be a QS in construction, just to move into the area to form and hey edit, but did it just to get the free degree and there was a good job and there was money when you had qualified and all that stuff you were interested in when you were 18. But looking back now, that my knowledge was through the floor, what keep you going, doing your job was just your professional pride and motivation to just be not doing a bad job for somebody who's paying you. But when you flip that to when I was writing and teaching, and obviously now marketing, that was a completely different drive 'cause you love what you're doing. And I'm stacked out at the moment and busy but every task you're doing you're enjoying. - So, that's the big difference. It's just enjoying the task that you're doing as well. You're lucky I think, if you can find that. You're very, very, unlucky if you don't have it. - You've gotta find it, you've gotta find it. And I think it's wrong, I think it's wrong to be doing something that you don't enjoy because your life's disappearing in front of your own eyes. Yeah we spoke about you, didn't you, been in a corporate world for so many years that you actually don't want to be in. But you're just in it, and and you're not sure how to get out of it so you just carry on, it was too. -plus hours a week doing something that you don't enjoy. So you got to choose and find your motivation somewhere else I got family members who write off that 40 hours as a way of paying the bills and then they're motivated to go do something else in the evening. Motivated to travel every year or something. - But you think with that though, I hear loads of people say "I've only got 10 years left." If someone's working towards retirement, I've only got, and I'm like, 10 years? And they're really unhappy, but they're working towards that retirement unhappy for 40 hours a week. Although what they'll do is they'll say, well that brings me happiness in other areas like you're saying, and my challenge to that is imagine if you could find something that you did for 40 hours that you enjoyed. You'd now have every hour of your day enjoying what you do. - I think you go back to that first point that a lot of people don't think that you're allowed to go and do that. - A job's a job, you should be happy you got a job, and that's that, take your wage. - But that's, like I was saying, no you should be happy you've got a job. - Money doesn't grow on trees. - It's very true that we become our environment don't we? And I remember growing up very often all I would hear is "well it pays the bills." So you hear, I do it to pay the bills and you grow up thinking, all I've gotta do is pay the bills but what about doing things that you enjoy on top of it? But you didn't add that because it was only enough money to pay the bills. And I think one of the biggest drivers for me and something that stuck with me is my mom just always said to me, "Whatever you do, don't live your live like us." I know that sounds like, deep and quite painful. But my mom used to say, "Luke, whatever you do "Do not live your life like us." Because we have no money, couldn't go on holidays, you know, my dad from the age of 30 quit work from sickness. My mom was a cook and a cleaner, so we had no money. Walking to school an hour and back, football boots, got to play at Wembley Stadium when I was 10 in a six aside tournament and all the kids were getting bought brand new football boots and mine had a hole in and my dad said because it was the end of the season he didn't want to buy me a new pair because I might've grown out of 'em by next season. So he taped 'em up with like masking tape, so he taped 'em up and my left foot had this black masking tape, and you can imagine all your pals taking 'em in. But the lesson behind it was great, and that lesson took me, like I still feel that kind of characteristic now that he gave me, was like, you don't need the new boots. - They don't make a difference. - He used to say to me, it's not the tools it's the person in 'em. And I was like, do you know what? I don't need new boots and I went out and scored two goals and I got player of the tournament. So in my mind it was like, I was not happy at the time to have black masking tape round my boot. But it gave me that character of, no matter how tough things get, there's always a way. You know, you don't need stuff, you can make the best of what you've got. And that's what I did, and I think my upbringing and my parents being quite hard on me like that to the point of, if when I was a youngster I might win a trophy that would be "most improved player of the year" and I'd be super buzzing with that, I'd get in the car and my dad would say, "You must've been rubbish to start with, son." And then I was like, gosh. - Gosh, so then I'm like, right, okay, so when you start to win player of the year and match's player, that's when you can celebrate. Winning most improved just means you were rubbish and now you're okay. And I was like, maybe it does. But I remember them moments and them moments gave me the drive to keep proving people wrong. Sometimes what it does on the downside is you never enjoy the moment because you're always looking at what's next. So I think I've spent many years of my life achieving something, not celebrating it, and just looking at what's next all the time and never really enjoy the experience in the moment because I was scared to in case I was being complacent so you're looking at what's next. So there is a downside to that mentality. -learn and we found a few pitfalls with that earlier with the group and now we ask a lot about, who do you follow on Twitter, who are your influences. - Yeah, I mean you ask outright, what's your passion? Which I think is great, I don't ask people that. But why not, it's great. Yeah, how would you learn and stuff? And when you see people stumbling around, how would you learn, you can tell when someone's not into it at all. Some of them will go, I love Gary B, I love all people that were really influencing online like Rand or someone like that and you can tell they love it. I think that's made a big difference when I've been interviewing. It's cut people down a lot and it slower to hire but I think when we get there we'll find people who love what they do. - Quicker in the long run though, isn't it? - It is, yeah, so they can stay at it and enjoy it. - I mean we've chatted about this, in our industry you have to make a lot of mistakes. Technology is that quick and we have to make a lot of mistakes in art and social media people you see and our ads go down sometimes, don't they? we spoke about it, I mean, how do you handle that, just? - Well, yeah, dunno, yeah. You just gotta think that we are the experts in the industry and the whole industry's, you know, jumping and changing and wriggling through what's the right and wrong concern. I think it's just the attitude and the approach to, we know these problems had to be fixed and that's why we do what we do and that's why the clients have, we're trying to solve problems, really, at the end of the day, and you've got to find out the right way. And I think yeah, like you say, the approach and the attitude to doing that and being motivated and enjoying marketing and enjoying those problems. You've got to find some weird, sick enjoyment in these problems and headaches and they always go, ooh, am I right, but eventually you work as a team and get there. - I think looking at what is the return, you know? Is it just profit or is it learning? Is it development, is it X function? And just you know, our unmarked is the easiest one to go with. - It'd be a tricky one, selling that to a client I can imagine, but, you know, return is learning and getting better and fine tuning so I could see why you do that. - I've had that conversation with Ad Words, with Ad Words they say what you need to do is you can do all the research you ever wanna do around PPC and we can find out the key words we can look at estimation conversion rates but the only way you're going to know if something works for you is to test it. So, whether you like it or not on Ad Words you've gotta put your products and services on it you've got to throw some money at it and we call it a burn period which people probably don't like 'cause it's their money but you've gotta go through that period when you're looking at page to find out what does work, what does get traction. And basically what you also do in that period is pay for data, you pay to find out what doesn't work but once you've gone through that, you've paid, you know where to double down on and you know what to call out. But without investing in failing forward or whatever you want to call it, you would never get to the point where you know what works and what doesn't. - I was like, it's a big bullet. I say to people, why do you watch a film? And you know, they watch a film to see what happens at the end, but you don't know what the end is 'til you watch the film. So until you start something, you don't know how it's gonna turn out. You're watching it with the best intentions that you're gonna enjoy it, and if you've watched it for two hours and it wasn't great you'll then watch a different one. I think that's the same with marketing or whatever you do. My life was about becoming a football player. That was the goal at the beginning, that was the dream, I had a purpose, I was passionate. I got so far, and it stopped, things changed for me. And I went through a kind of awful area of adversity, challenge, and a real challenging time. But I had just found something else. - So it didn't work, go onto something else. It's the same with marketing, it's the same with going to the gym. You put the weights on the squat rack, and you can't get up. You take the weight off and you try again with a lighter weight. - That's definitely a challenge we have had. - That's funny, I asked to chat before the podcast where we were talking about your programme being 12 months. And it's similar with our programme an inbound programme can be 12 months and people want the quick ones. - In month one, and "so how long is it?" -30s, thought, well, I'm doing what I do now and that's it. Now they've gone off to do other stuff, it's amazing. - I'm gonna cop that and that's going on our homepage of our website. That's the analogy for Inbound, Mark. - We'd always go through this stage where you end up saying to a lot of people, just hold your nerve at six months and just hold your nerve, you're on the precipice, I'll help you say that word, but you're so close to it that you're happening and we've got all the charts and all the clients where the curves are like that, it's exactly the story of the bamboo, isn't it? - [Luke] The break through ground. - When you do, when it's like that first, it gets when you first start your business you get one customer then you get 10 and 30 and 50, but to get that one, it's hard. - You've got to start, I remember when I first started doing fitness instructor many years ago. I set up this circuit class, I was really excited about it I expected 50 people to come. One guy turned up that actually worked there so it was free, so I didn't get paid anyway. So I went on a Friday night, set it all up, planning it for all these 50 people, Saturday rocked up, one guy turns up. 'Cause he owned the gym, it was free. And he was like, do you still wanna do it? I was like, definitely, you turn up I'm gonna give you my best. So I gave him my best. Within four or five weeks I had 50 people because that shows to just keep going, keep going. The first seminar I delivered, two or three people. Do you still wanna do it? I go, definitely, 'cause I'll make a difference to you three that'll tell ten about three and next time I'll have hundreds. And that's just what's happened. And it's that bamboo, and I tell myself that all the time. I'm gonna break through the ground, when I do I'm just gonna explode. I haven't exploded yet 'cause I don't think when you're hungry for success you ever do, you just, it keeps growing and you keep going, don't you? - Definitely, I love that. - Isn't it great, yeah? - That's a great analogy for how it works. And we have to have that conversation a lot of times. And here if you start listening to this and you're trying to pitch Inbound to your boss and you gotta have that awkward conversation around the six, the nine, the 12 months which your boss doesn't wanna hear, they want the quick wins they want the PPC they want everything to happen tomorrow. I think having analogies like that, I mean you use them a lot, don't you, analogies? But having some analogies like that does help relate the situation. - Mine's not as that one. Pretty good yeah. - We'll use that next time. It's got good story around it as well to my analogy style. Very quick and sharp. I like, you hold them back a little bit so there's an ending to them. - That leads us on, I mean Paul's got some questions in there but it leads us on to leads and beliefs so the last two talks, we've just done a webinar and the last podcast, which was all about video marketing podcasting. And we didn't realise, we build the slide then but what then is about the psychology of fear, of camera, fear of judgement , getting on camera and how can these guys overcome such things as getting a camera and having them do this. 'Cause you've just walked in, you settled back, you sat back, you said yes straightaway, not an issue. Where with my other guests on the show, we were really had to fight as well, I mean. You can see 'em clam up a little, it's in there. And what advice could I give the viewers? - So it's a really interesting question because I honestly believe that you can fake it 'til you make it, and I really believe that because I don't come in here super comfortable to sit in front of four people, four cameras, doing a podcast that's gonna go to thousands of people. I put myself in the right frame of mind to be comfortable to deliver the best. - I can't believe I said that. - So I come in and I'm not scared or have fear of it, I'm nervous, I'm excited, I feel the adrenaline of when I was a sportsman again because I want to do a great job because I know how many people it could influence so I always wanna perform my best but what I can do is I can walk into any environment and just click my fingers and be the best I can be because I lose all fears of what people think and the inhibitions and what if I don't say the right thing where many years ago, I'll do, words don't come out right, what if I forget what I'm saying? What if it's recorded and it gets posted with somebody criticise it? I've gone past bothering about that because the mad people that do enjoy it, for the odd one that ones to criticise it's a different balance, so, to help that kind of mindset, for me it's jut a real strategy in your mind of create the image of who you wanna be in that moment, tell yourself you're that person, and just go and fake it. And then you sit there, and actually you're enjoying who you are, and you're like, actually I was pretty good there. First time I stood on stage, I took myself back to when I was a footballer. I was thinking, how can I stand onstage and feel powerful and exciting and dynamic, when have I ever felt like that? The only time I'd ever felt like that was when I was a football player and I would be in that game and it was like heat of the moment and you fly into tackles. That's when I felt my best. So I just thought about the best games I ever had of how I felt, felt that feeling, held that feeling, and I walked out onto that stage like it was a football field. - It was my arena and I owned that arena again. My dad always used to say to me before every football match, you stand there, you look at your opponents, and you just think, I'm gonna take you down. The first chance I get. - You're a Dayton player then, aren't you? - Watch yourselves, guys. A slide tackle. - I still have that same energy there, I'm here 'cause I'm here, I deserve to be here. And I tell myself that, which I deserve to be there and lot of it's just self talk and not true. But who cares, because if if it means you perform in the moment, it gets you through what you're gonna do. But for people that really have that kind of fear of doing it, there's so many strategies that you can develop. Think of a time when you are comfortable. So when is the most comfortable time when you feel confident and most relaxed? Go to that place in your mind, go to that place before you're about to do something that you're uncomfortable with, draw a circle where you're gonna sit or where you're gonna stand, within that circle you're gonna allow yourself to feel like that and then when you sit in it or you stand in it you're thinking of when you was a child on holiday or whatever it was, and it just brings you down. And always think of the reason why you're doing it. You made a good point, you're looking at problem solving because of the end outcome. So when things are tough, you're always looking at the light at the end. Why am I doing this? It's to get to the end of where the light's gonna shine. So if you're gonna be uncomfortable for 20 minutes to do a talk on camera, just think where that could take your business, it could help the people in front of you, and that's usually more powerful than shying away from doing it. - That's ultimately what's got me to do this eventually. I do another video series, and what got me to try and get this together and do it was ultimately, fear of judgement and everything was so great but what was greater is that in five years' time if we don't do this we're gonna be pretty irrelevant. This is the way marketing's going and if we don't do this, the other outcome's worse. And obviously the positive outcome of it is we can influence a lot of people. We can be early adopters and we can be there so that when other people are in our space they're behind us already. So that's where I got the. - [Luke] You've got leverage on yourself. - Really, if you didn't have to do it, you probably wouldn't do it. -old boy so small and scrawny do that? And the old man says it was because, it was because, I'll tell you that bit at the end actually. - I'll come back to that bit. - Oh, you've got us twice. I actually told you what the headmaster said already, didn't I? - Okay, we'll finish on that as the last words. - We'll finish on that one. You know what, I think that's our questions Paul, regarding speaking. - Yeah, just like process of, obviously you've got public speaking, you've exposed one trick. - Just wondering what your process is before you do a talk like the one Rikki and I watched a few weeks ago. Obviously it was all off the cuff, it felt very natural. Is it rehearsed, is it the same talk? Just what's your process for public speaking, really? -minute talk, very rarely I deliver the same talk twice because for my own energy I want to keep creating new content so I might take one story out and put a new one in with the same kind of tempo of talk. And for me it's getting the right energy level so like last night I delivered a talk to Millwall Football Club, I was waiting four hours to deliver it 'cause they was held up in traffic, so I'm up for it, I'm ready and then I'm down again. And we didn't start 'til nine o'clock to 11 p.m. at night, so all of the sudden you've gotta be ready for that and you've gotta perform. I've driven four hours, it's a lot. So, it's getting back to that, my outcome is to achieve that, I've got to do everything I can to achieve it. So you've got to have a script of content, bullet points, but if you're reading from a script it's not real and people don't buy into it. -scripted route which is what we're doing today we've got maybe five or six things that we wanted to kind of talk about but everything that happens around them is just off the cuff and the conversation goes the way it wants. When we did scripted, in the end you end up talking stupid and slow, or however you react to a script. When you go completely unscripted, you end up just waffling in the wind especially when you stick us, for instance they talk about Mark however you want for half an hour. It could go anywhere, so. - Yeah, yeah. You think about the script. Outcome focused, create content to achieve the outcome and I go over it that many times in my mind to feel like I know what I'm gonna do when I'm there 'cause I'm a big fan of visualisation, so if I'm gonna do a talk I'm already imagining delivering that talk days before. Sometimes I might be delivering four or five in a week so it's like on the day of, now, right, what's this talk gonna look like? As soon as I've done that one I'm on to what I'm gonna talk about, what's the next one look like. - So it's visualising doing it that when you're there you feel like you've already delivered it, that it's comfortable for you. And I love it sometimes, you know, last night my talk was planned, it was a presentation I had planned. I turned up, there's been a mistake, there's no audience, there's no computers, there's no nothing. We did it in a canteen, so very fast you've gotta change everything that you've planned and quickly do something different. I think that's with experience that you can do that. - I like the visualisation thing, it probably works well before an interview or a big meeting. - A match or something, definitely. - I would say back to an early question that you said, how do you help somebody that's uncomfortable with public speaking or doing any kind of interviews. Visualise it that many times that you feel comfortable that you've already done it. 'Cause when you've already been there and you've already done it, it's like I've done this, so I'm all right. - All the time. Think, Mohammed Ali was the greatest ever and he said he used to visualise every round of every punch so when the punch come he knew where he was gonna move rather than standing there and the punch comes and you're like, where do I move? He'd already moved, in his dreams, in his thoughts. So your thoughts become so powerful, you trick yourself that you've actually already done it. So the public speaking, you've already done it. - By thinking ahead of the questions. - Because if you think of what questions might come up after, you've already prepared a little bit or you've prepared for one similar, so. - And I think it's also being, just knowing what you need to know. You know, I wouldn't stand up and talk about maths or English because I'd get found out. So I'm comfortable when I'm stood there that if anybody puts a hand up to ask something I will know, I know my area. If they ask for something out of it I'm confident enough to go, that's, I can't know that 'cause I don't really know, you know? If you ask me how to become a super phenomenal marketer I'd be like, ask Rikki. If you ask me how'd you go from there to there, I'll be able to tell you, I believe you can do it. So stick to what you know and be confident in your arena, 'cause you get questions that you can't script for. So when the question comes, you've got to be able to respond in a way that's the best of your ability but that's knowing your craft and being so passionate with yourself learning and developing there. Someone throws a question, you're ready. 'Cause you're just, it's there, you know. You believe in what you do, it's ready for that. - Now how do you stub out the monkey man, the tin man, negative thoughts? So we're in front of an audience now, And this little tune kicks in and goes, what if they laugh at me? - What if that happens, how do you stop that stuff from? -minute talk." And everybody claps as you do, and then all of the sudden this guy walks up to me from the front and he puts his hand out and goes, "Thanks for that, it was brilliant." - Had you perceived it. -reading, so I think one of the biggest causes with personal issues with work colleagues, friends, family, loved ones, public speaking, is mind reading when you've got no evidence of it. -reading. Instead if it happens now I think, they're talking about how brilliant I am. -reading, what will people think when they watch this video? What will they say when they hear it? It's like, don't worry about it. - Just break through it. - Yeah, 'cause we all do it. You know, sat down I think the first book reading and two girls laughing in the front row and it completely put me off. I ended up just facing the screen, just reading. I can't look at the audience, it could've been anything. - Oh yeah, of course it could. But you thought, oh this guy. - Could be one of your witty jokes Mark. - So I know we all relate to that story, we all do it, don't we? But we've got to wrap up now. So can you finish the story off then? - So the ice one yeah, so the boy breaks through the ice and he pulls him to safety and then paramedic says to the other paramedic, how has he done it? And the old guy shouts, it was because, it was because, and the paramedics started waiting for the answer and the old guy just goes, "Because there was nobody there to tell him he couldn't." -old boy hadn't done that his brother would've died. The purpose was so intense, he had to do it. So there was no choice. And I think when you give up that mentality, that you have to do it, you've just got to do it, it happens, but until you create that own inner desire and purpose, you know, why would you, he wouldn't break through the ice but his brother went under it. You wouldn't have done your podcast and video if you didn't believe it would take your company to another level, it gives your company a better platform. - So you've gotta create a purpose and a passion behind it and the fear of failing should never stop you. - Yep, that's a pretty happy place to end. - Where can people find you, have you got a website? People can learn a bit more about you? - Yeah, yeah, you can find me at, www.lukestaton.com. Instagram, @LukeStaton1, same on Twitter or Facebook, I'm on all the platforms so I'd love to connect with people there. - Thanks for doing the show notes. And thank you. - I enjoyed it too. - We'd love to have you back, so hope you enjoyed it, leave us some comments.